Examiner.com is a news, lifestyle and entertainment network, with content created by thousands of writers, otherwise known as Examiners, all over the world. After its launch in 2008, Examiner.com grew rapidly, faster than any of the other top 30 news sites in the US. Today, over 20 million people visit the site each month, seeking out some of the best new online content from around the world. 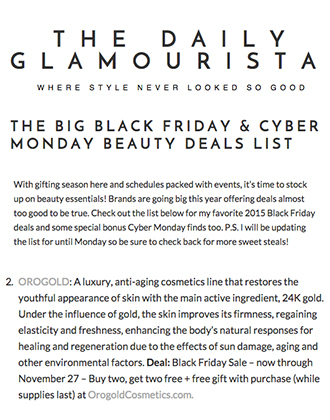 Examiner.com has a fantastic beauty section, featuring industry news and trends, as well as the latest beauty products, beauty advice, how-to guides and much more. 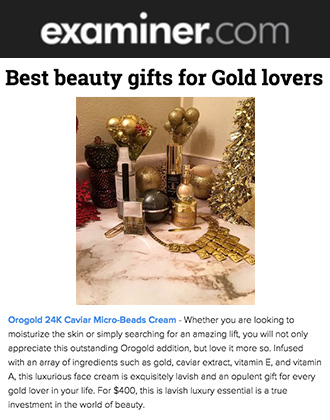 In order to help their beauty-lovers with their holiday shopping, Examiner.com recently published a post titled “Christmas Shopping Guide Part 1: Gifts of Beauty from Dove, OROGOLD, Gavee Gold”, and we were excited to see that our OROGOLD Box Gift Set made it onto the shopping guide. The Examiner begins by commenting that each of the gifts featured in the guide are so convenient to buy, as they can all be ordered online. 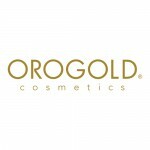 The very first Christmas beauty gift on the list is the OROGOLD Box Gift Set, featured below a photo of the set and its products. The Examiner appreciates how the gift box “comes already gift-wrapped”, and “features a golden trio of face savers”. The first of the three products in the box is the 24K Foaming Cleanser that “refreshes, reduces impurities and leaves a golden glow”. The next product is the 24K Salt Soufflé, which the Examiner explains is for the body, and will “leave her tingling all over”. The final product is the 24K Deep Day Moisturizer Cream, which has been “infused with gold and sunflower oil to reduce the appearance of wrinkles and expression lines”. The Examiner then gives her readers a very useful tip: “If you really want to splurge on her you can pop for an OROGOLD subscription for $192, which comes with privileges such as handpicked samples that arrive four times a year, with three premium products and exclusive discounts”. 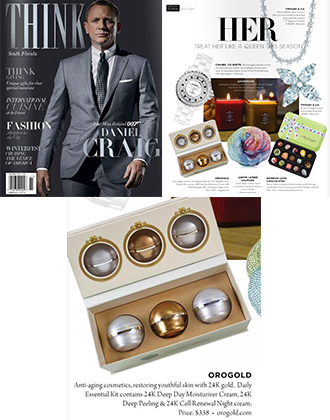 OROGOLD would like to thank Examiner.com for featuring the OROGOLD Box Gift Set in their Christmas Shopping Guide. The gift set costs just $78, and can be purchased online directly from our website.